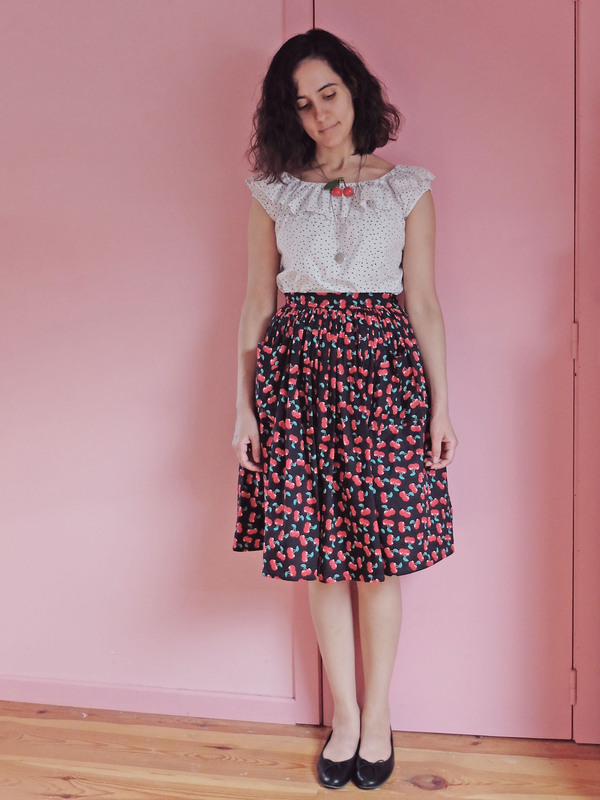 What can I write that I haven’t written before, especially since the fabric I used for the Ondées is the same as for my first version, only in different colourways, and the fabric of the skirt is the same as for last week’s culottes, only with vertical stripes instead of flowers? 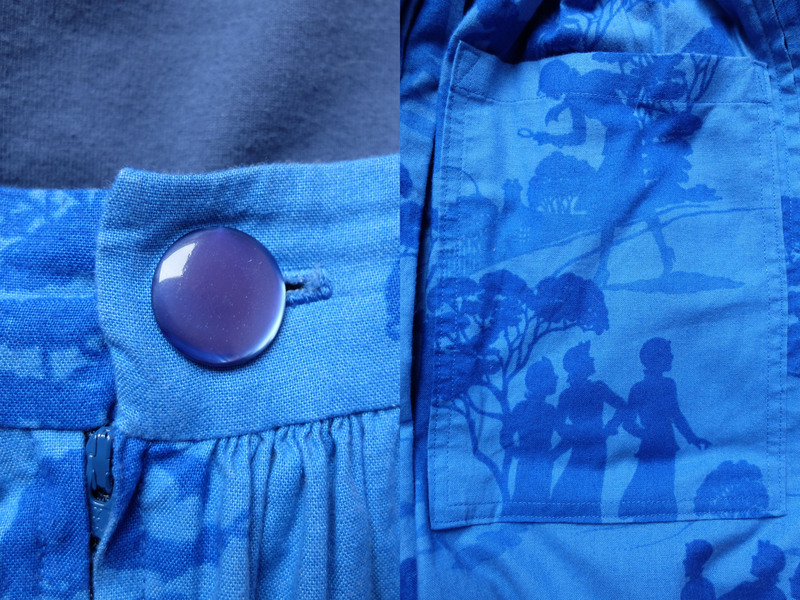 I also used the remnants of the culottes for the pockets and the covered button, so really, nothing new under the sun. I even bought the fabrics in the same place. 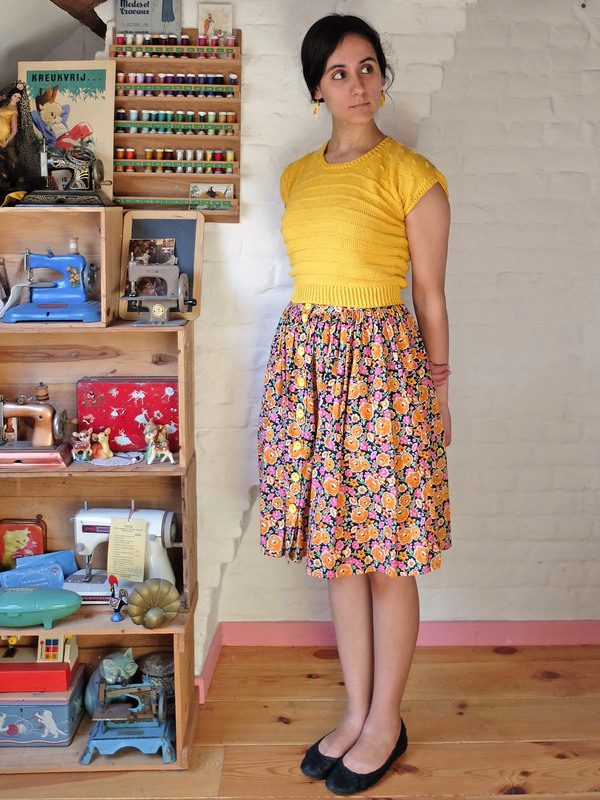 Oh, but wait, I did use a new pattern for the pockets of the skirt! 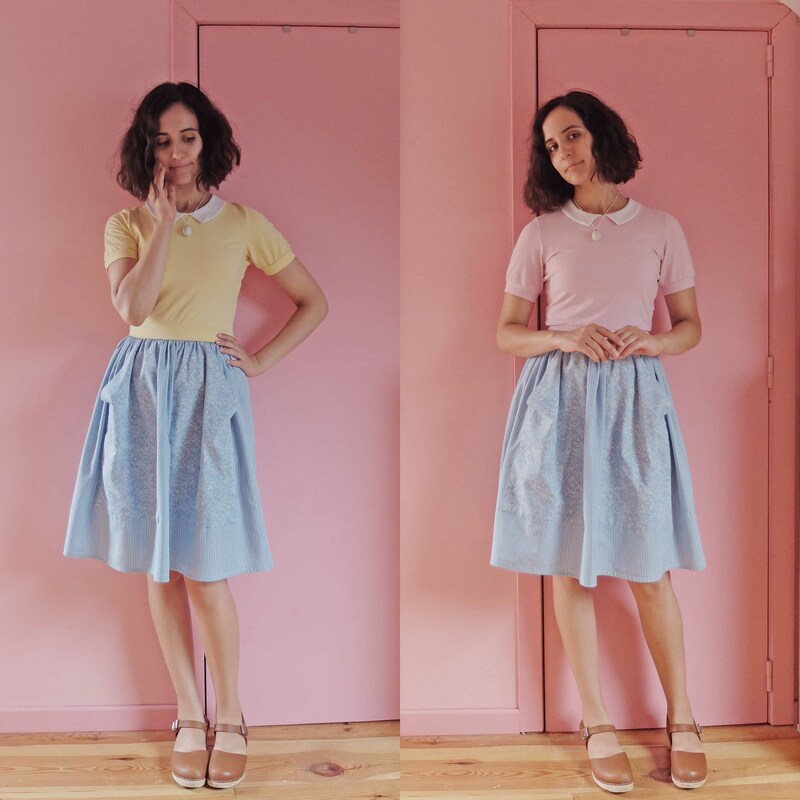 Burda 06/2015 #103a is a gathered skirt, so they only provide you with measurements, no pattern pieces, except for the pockets. I used my usual gathered skirt measurements instead of the pattern measurements, but I did use the pocket piece! I love those pockets: I can literally fit a cat in each one! Now if only my cats would cooperate. 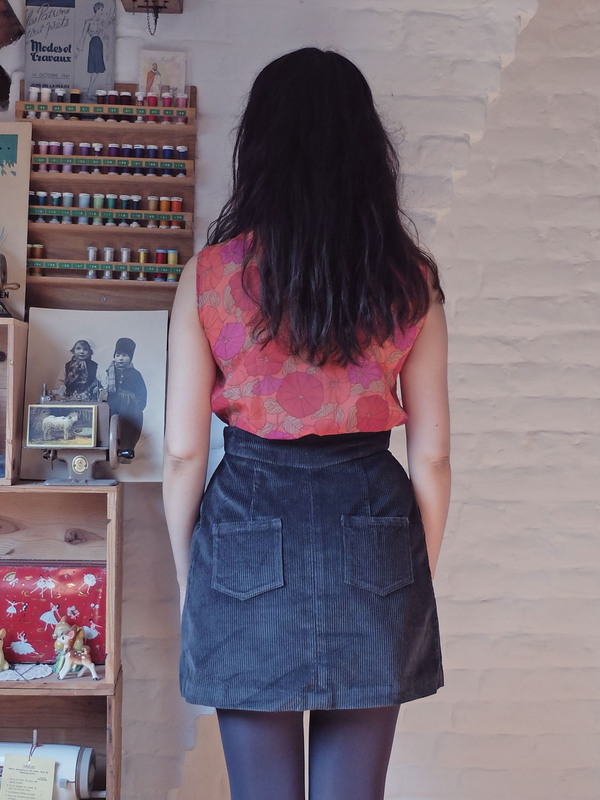 I have been more into skirts that fall below the knee lately and I would have liked this skirt to do so, but I didn’t have enough fabric left after straightening the grain (I lost about twenty centimetres, grrrrr! ), so this length had to do. Judging from the crazy amount of times I have worn this skirt in almost four months, I think I might survive the trauma. 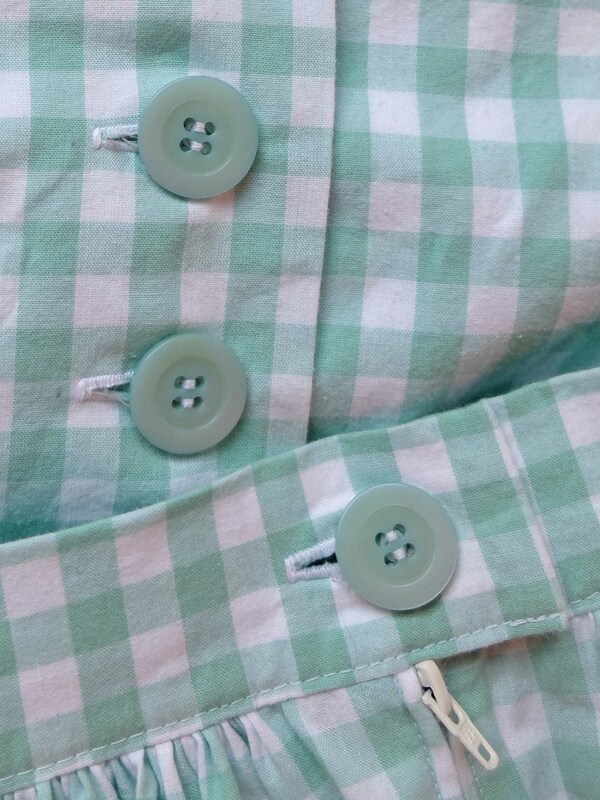 When I came upon this mint gingham at the Stoffenspektakel with my partner in crime, I immediately thought of making it into a matching blouse and skirt. 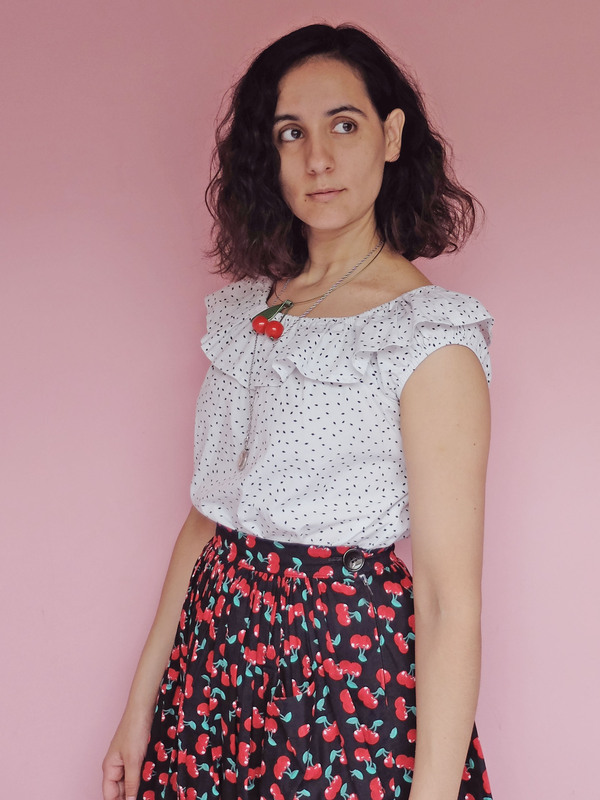 I knew the skirt would be a simple gathered one with giant patch pockets, because you do not change a winning team, but I dithered on the question of the blouse. 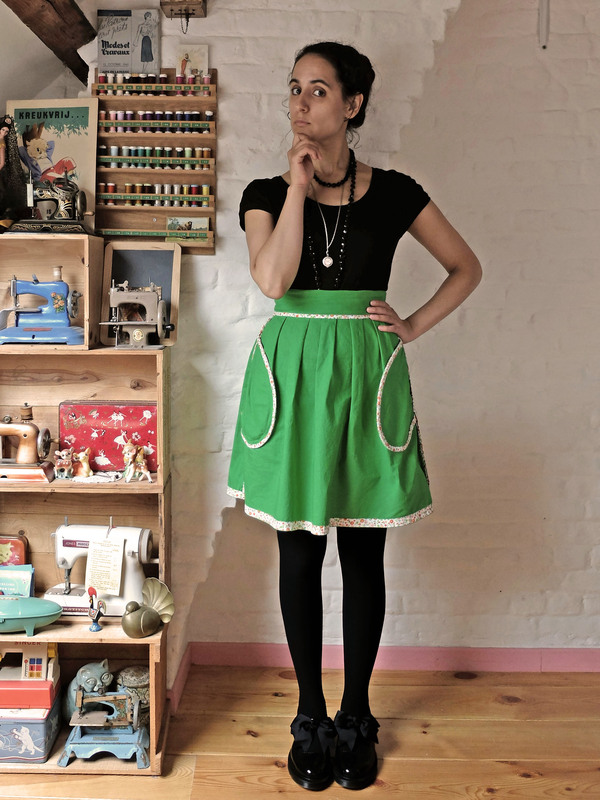 At first I wanted to make a Mélilot, then thinking I could wear it tied at the waist made me think about Camille’s versions of this Burda model I had in my stash, and then I remembered Gertie’s pattern, Butterick B5895, which I also had in my stash (is there a pattern I do not have in my stash, that is the question! ), and the deal was done! I went in search of reviews of the pattern, and a lot of them warned about the surprising amount of ease. I took a look at the finished measurements and chose to cut a size 6 instead of between a size 10 and 12 as the body measurements would have had me cut. 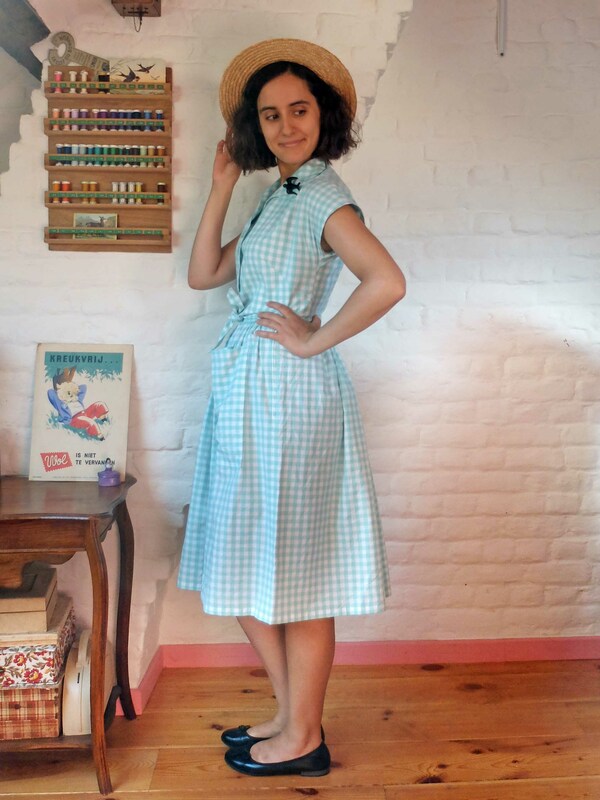 Now, the ease wouldn’t have worried me so much was I going to use a drapier fabric, but with this light but stiff gingham I thought it would be wiser to go down a few sizes for fear of getting a much boxier blouse than I intended. Another thing I read in a lot of reviews was that the blouse was very short. Once again I referred to the finished garment measurements (I also measured the length of the pattern pieces just to be sure) and I decided against modifying the length. But it’s true, the blouse is indeed very short: I suspect I am very high waisted and it falls right at my natural waist. The pattern only has four pieces, but man do some of them look weird! The only tricky part to sew is the collar, for which you need to be very precise in your cutting, marking and sewing, and I found the instructions perfectly clear. One thing that worried me was that the grainline does not run parallel to the centre front line, so I had to ignore the grainline on the front pieces for the plaid to be straight on the button bands. Fortunately, this did not cause any problem in the end, phew! 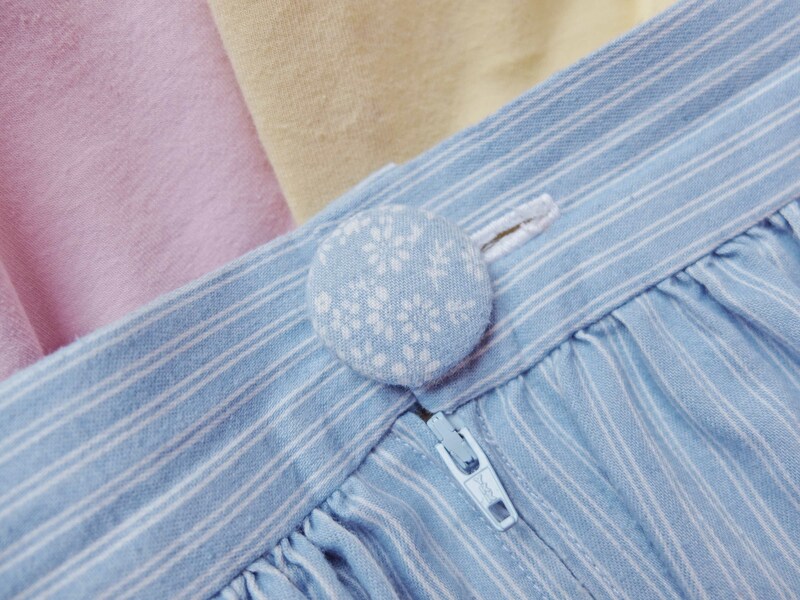 The grainline isn’t parallel with the centre back either and I actually like the effect there, but I know it would have bugged me to no end if the gingham didn’t run parallel with the edge of the button bands in the front. When I first tried on the finished blouse minus the buttons/buttonholes, I realized that going down two sizes and a half meant I should evidently have lowered the darts. So I set out to unpick the side seams and lower the darts by about 3/4’’. I think it was well worth the effort: here’s the before and the after. After that all I had to do was add the buttons and buttonholes (actually not that easy when you want your centre front plaid to match! 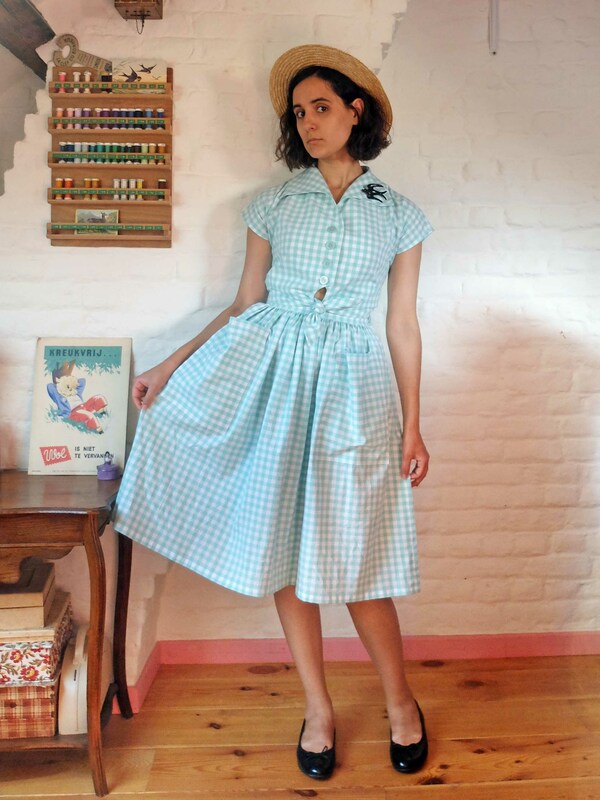 ), and then make the matching skirt! 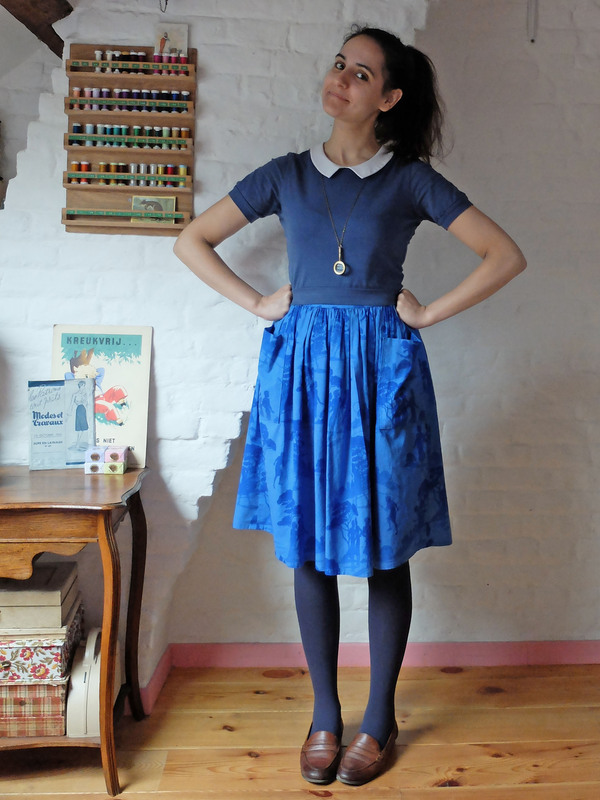 I don’t have a lot to say about the skirt, it’s yet another simple gathered skirt. Just like for the blouse, I took a lot of time pattern matching. Instead of pinning, I found it easier/faster (still very time-consuming) to baste the pieces together before sewing them. Once again, worth the extra time. I like my little matching ensemble, but in fact I’m not sure I’ll ever wear the two pieces together. Separately, yes (already have), together, I don’t know. Perhaps it’s a little too over the top? I really don’t know, we’ll see! And worse comes to worst, I’ll still have a cute blouse and a cute skirt! How many Ondées are too many Ondées? This is Ondée #6 (and — spoiler alert! I made #7 on the same day!). This is also far from my first striped top; what can I say? I know what I like! I’ve sewn a couple more challenging projects lately, and Ondée is still the perfect palate cleanser for when you don’t want to jump directly from one long project to another. 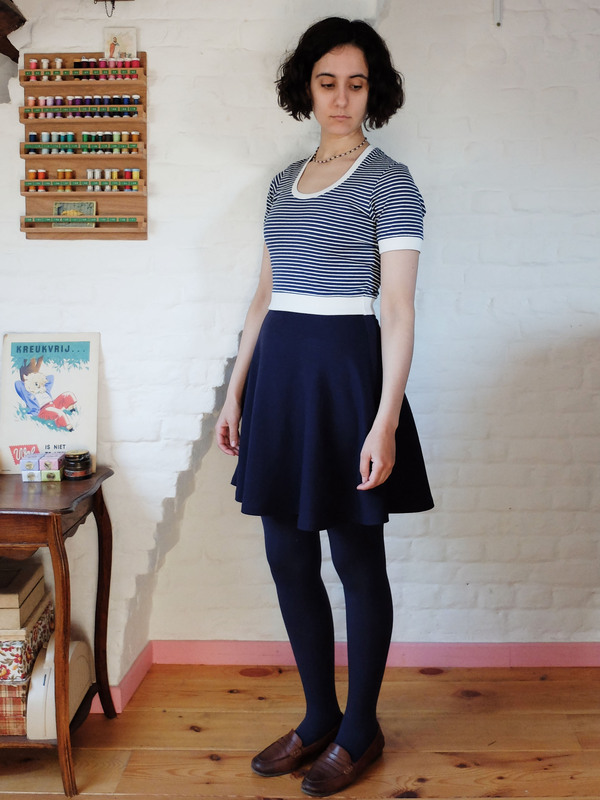 I made my usual size, and this time I used a navy/off-white striped cotton jersey with lycra, once again from the Stoffenspektakel. 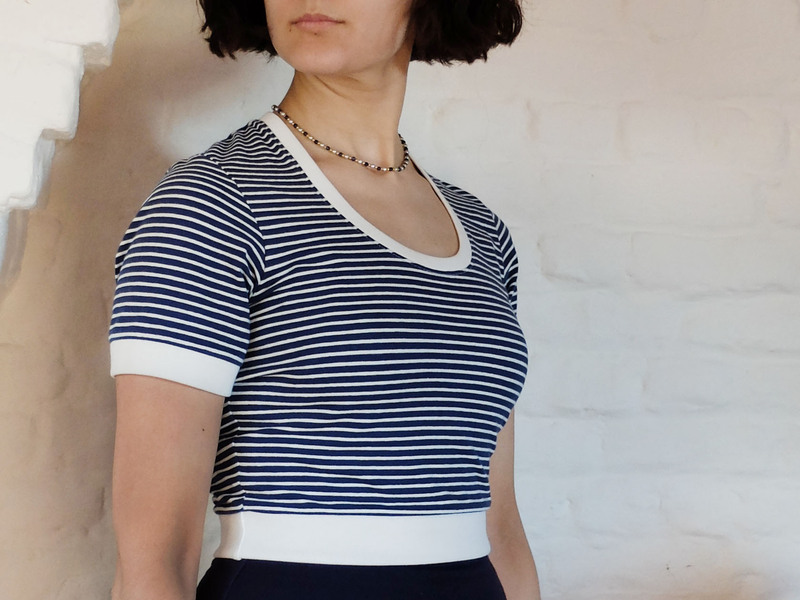 The neckline, waist and sleeve bands are made from the same off-white cotton ribbing I used for this T-shirt (from De Stoffenkamer). It’s pretty thick, more than the main fabric. This made it a little bit difficult to sew through the bulk at seam junctions, but it does look nice in the end. 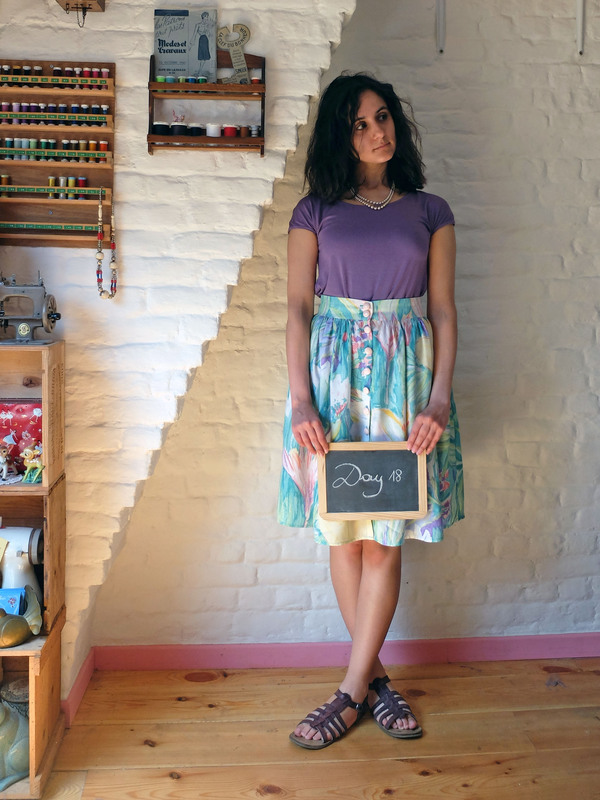 The skirt is one of Deer&Doe’s new patterns, the Zéphyr dress. A skirt version, obviously. I’m in-between sizes (36/38 waist) at the moment and I opted for a 36, which is perfectly comfortable, not too tight at all. I didn’t grade to my hip size (close to a 42), hoping the shape of the skirt would provide enough room by itself, and it does. 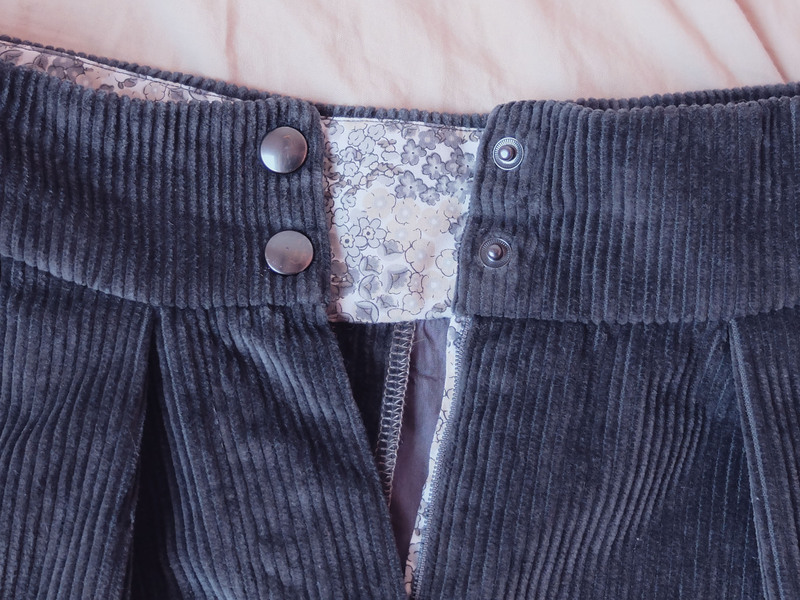 I do have to wiggle a little bit to put on the skirt, but that’s always the case with any garment that relies on stretch and not on any fastenings: if it fits my waist, it won’t easily get past my hips. 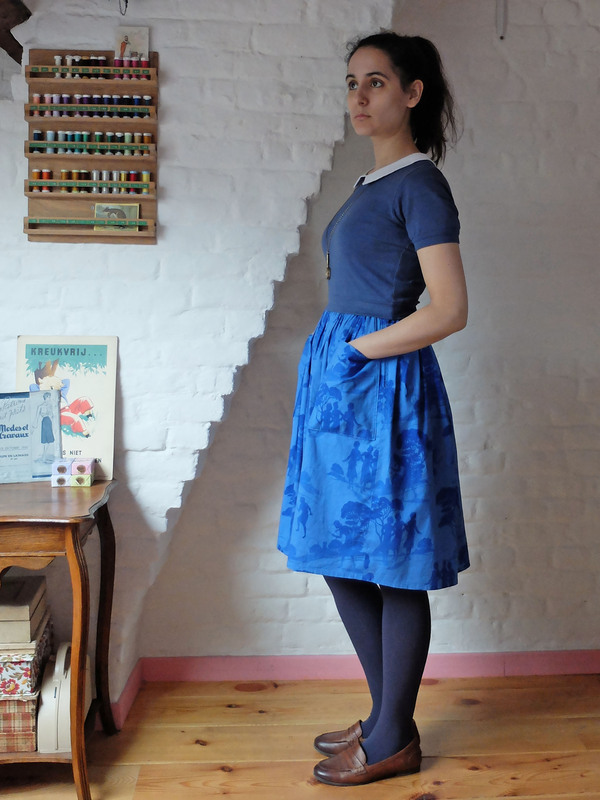 The fabric I used is a navy ponte of unknown composition I recently bought at the Stoffenspektakel with this exact skirt in mind. It is perfect for this pattern, just the right weight and thickness. 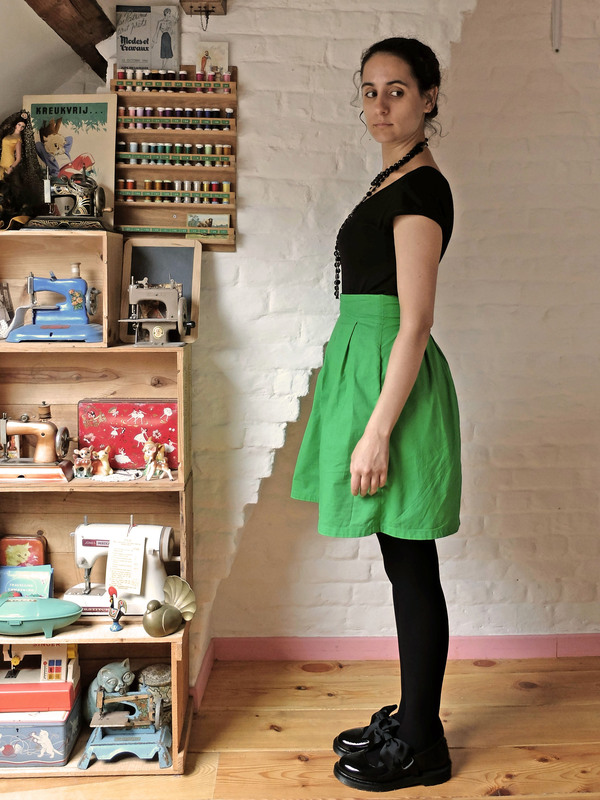 I pressed the waist seam allowance upwards and topstitched it in place with a three-step zigzag stitch because otherwise it fell towards the skirt and formed a bulge where the side and waist seams meet. I would do the same for any future version, except that I think I would use a plain zigzag stitch. The hem was serged, then turned and stitched with a straight stitch (no real risk of popping the stitches with this wide hem). 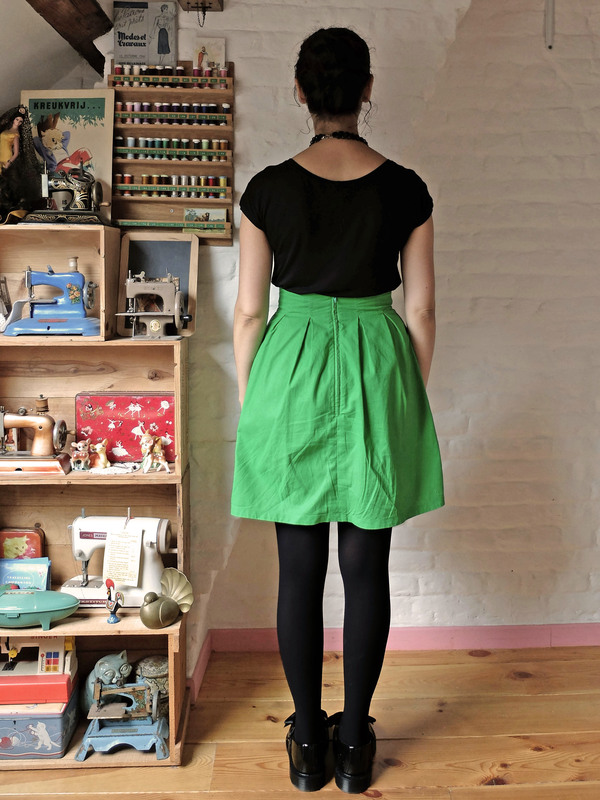 Like the Ondée, this skirt allowed me to catch my breath between two more complicated projects. I think this might be the fastest garment I’ve ever sewn! Two pieces to trace, three pieces to cut, that’s it! 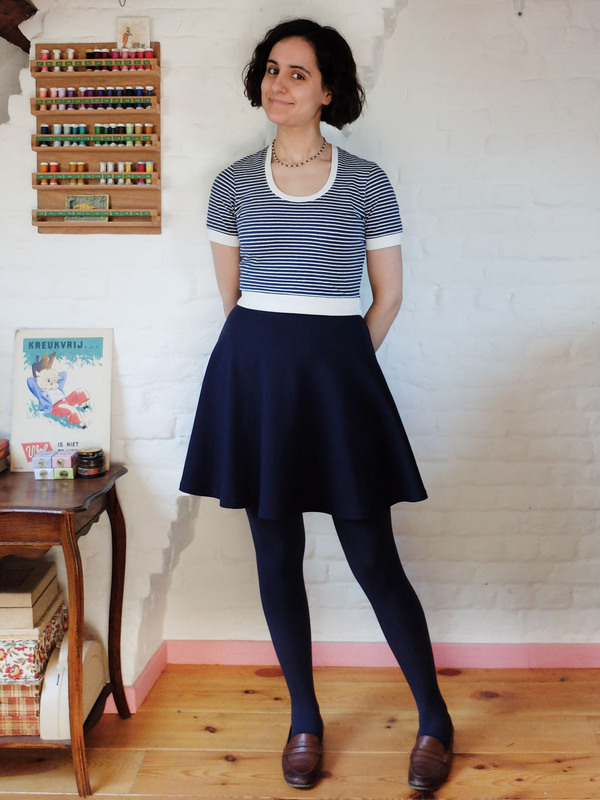 I don’t often make a skirt without pockets, but I think pockets would have ruined the shape of this one, so I didn’t add any. I’ve already worn it a few times, and the lack of pockets didn’t bother me too much. 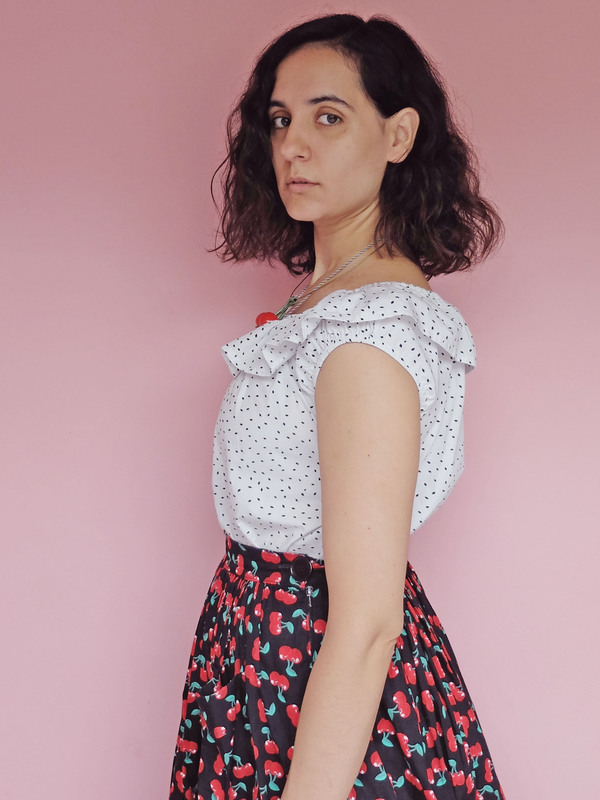 I sometimes feel almost guilty when I make such easy projects, thinking I should spend my time sewing things that are much more challenging, but then again I love the resulting garments, so why feel guilty when I should feel proud to be making pieces I’m going to wear on a daily basis? Just because a project is easy, doesn’t mean it’s worthless, does it? 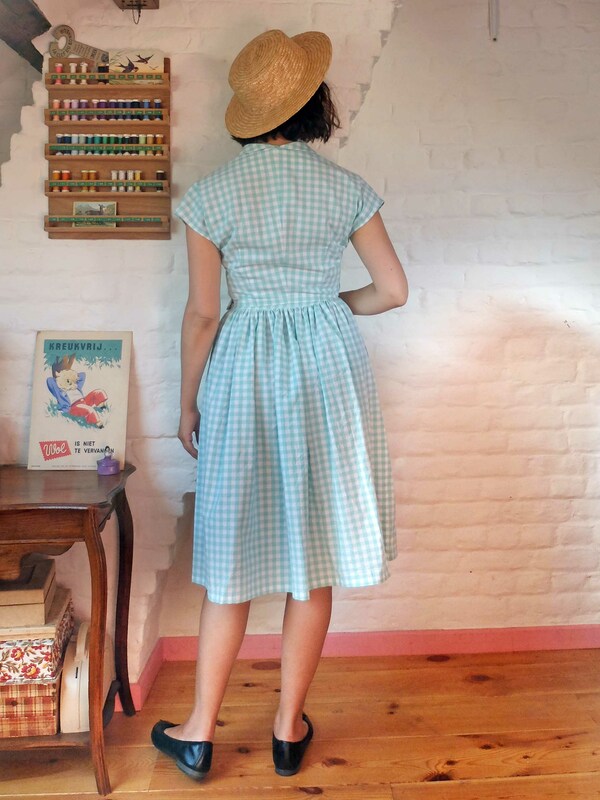 Like a lot of people who sew, there are many times when I finish a garment, vow to make another one because I like it so much… and then promptly forget about it. So when I told you about how much I liked my first Ondée and how I was definitely going to sew other ones, I was conscious that, even though I intended to hold my promise, there was a good chance I’d be swayed by the next shiny new pattern and never keep my word. But lo and behold, I did keep my word on this one! 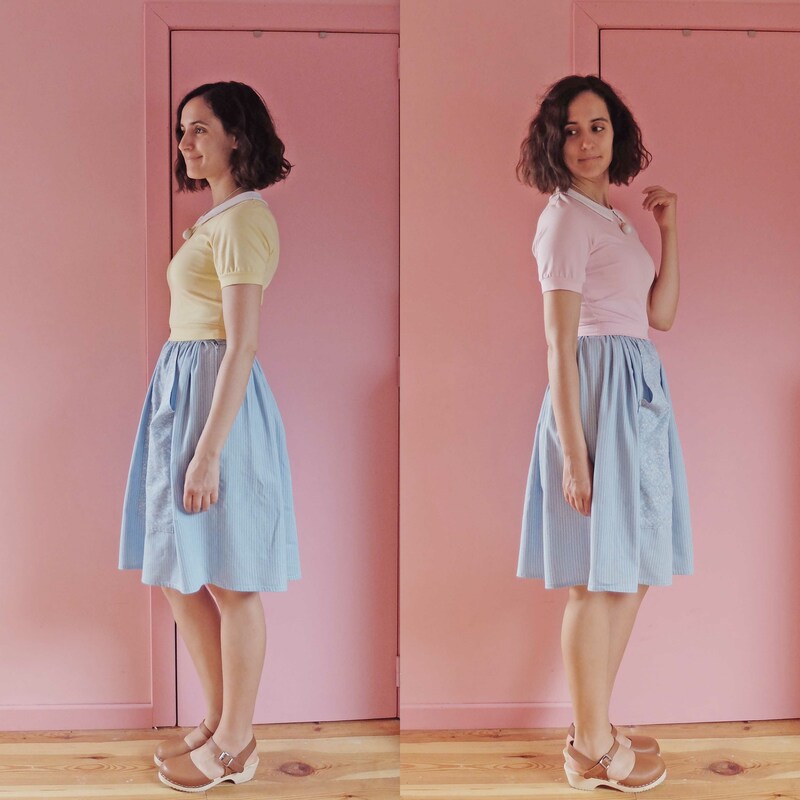 And the Ondée sweater is such a fast sew that I actually made two in one afternoon! I’m showing you the first one today, a blue one with white collar, which is also the one I have been wearing non stop since its completion. The main fabric is a cotton/lycra knit from eBay seller Tia Knight. 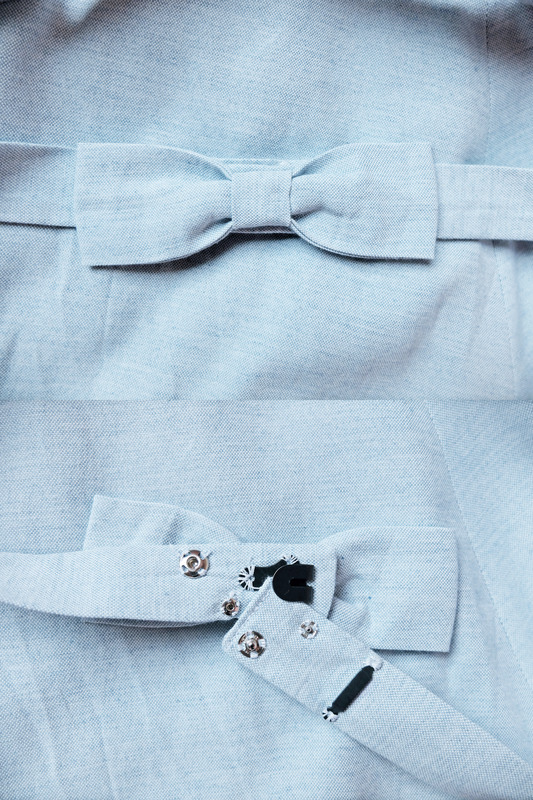 The collar fabric is the same I used on my first Ondée. 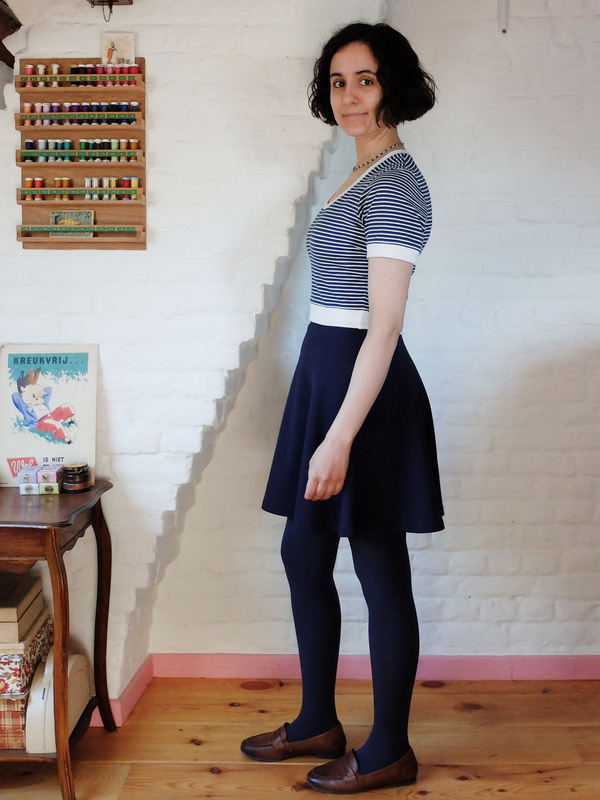 Looking back at that post, I realise I forgot to mention that I had bought both mint and white jersey knits at the Stoffenspektakel, where you always find loads of high quality cotton/lycra jersey knits in every colour of the rainbow! I also forgot to mention the size I made: a 36, my usual bust/waist size for Deer&Doe patterns. Like for the first one, I serged the whole top except for the collar (I didn’t feel like changing the serger thread to white just for the collar! ), for which I used a zigzag stitch. Once again, I topstitched under the collar with a zigzag stitch. 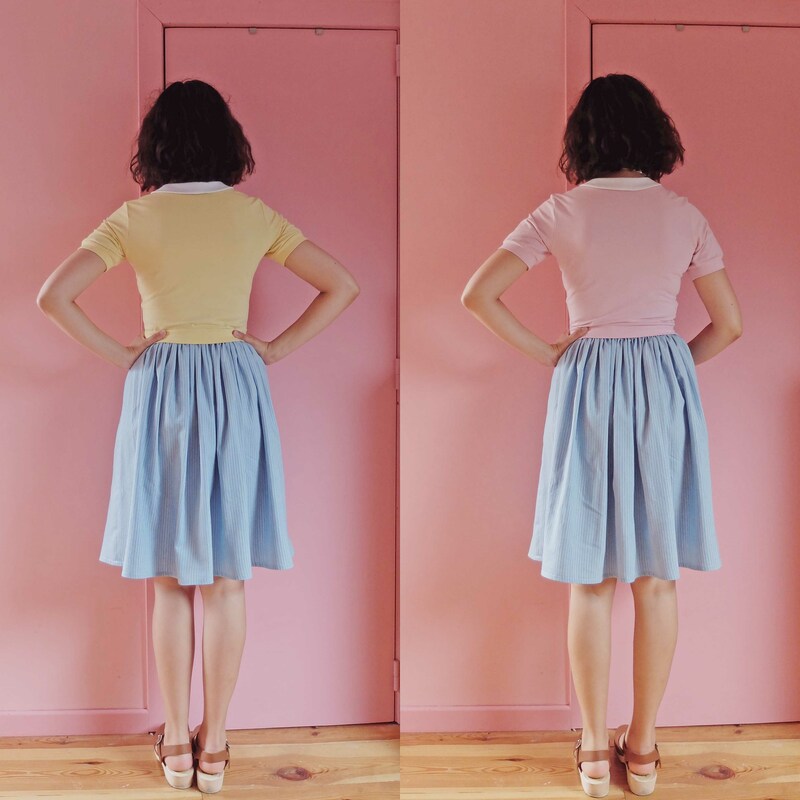 It’s a question of an inch, so the skirt is perfectly wearable as is, but it doesn’t stay in place as well as a skirt with zero ease at the waist. Despite that little flaw, I love that skirt so much and have been wearing it accordingly. Did you notice the print? It’s a Nancy Drew print! It’s from a discontinued Moda Fabrics line. As one of Nancy Drew’s biggest fans when I was a kid (while we’re at it, did you know that, in French, her name was “translated” to Alice Roy and she is widely known as Alice détective? ), I couldn’t pass up this fabric when I found it three years ago at de Stoffenkamer. 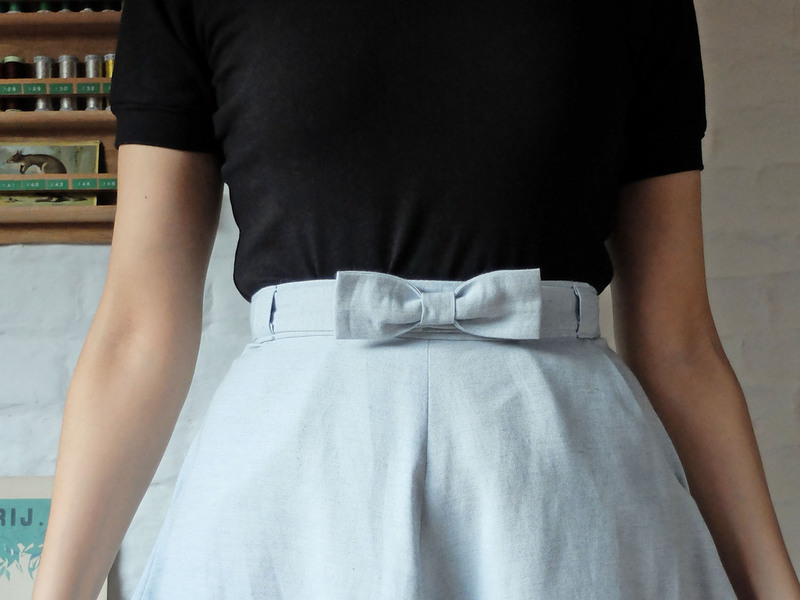 I bought it with the intention of making this exact skirt! I cut (more like, tore!) the pockets from the remnants so as not to waste any scrap that could be used. The fabric was narrow enough that I could use the whole width on each skirt panel… including the selvedges! A note about the fabric: it has that very weird smell (almost, I don’t know… fungusy?) when being ironed. I thought this was maybe due to a storage problem of some sort, but it’s been washed quite a few times already and the smell is still going strong every time it gets ironed, so I’ve come to think it’s probably the dye itself that’s to blame. Luckily, it doesn’t smell at all once it’s cold! This outfit is nothing complicated, but I have been wearing it a lot these past few weeks. When the weather was a little bit warmer, I wore it mostly with this cardigan, and these days it’s finally been cold enough to pull this one out the wardrobe. It’s an outfit that I think is both cute and easy to wear. I won’t promise anything, but I’d really like a few duplicate versions! Long time no see, huh? I haven’t stopped sewing and knitting of course, but I needed to put blogging on the back burner for a moment. I hadn’t imagined I wouldn’t come back here for over two months, though… It was really weird (and not in a good way) taking pictures of myself again… By the way, my hair looked smashing in the mirror, but in the pictures it looks like a hot mess, whatever. 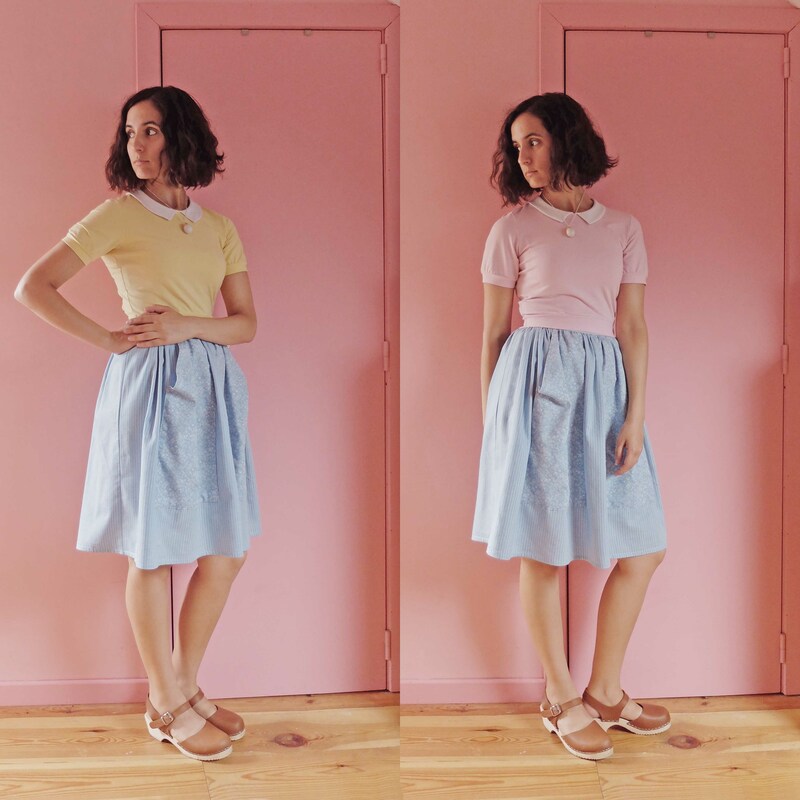 This skirt took two months in the making and still had to wait for close to three more months to get its blog post. I like that this allows me to speak about it more knowingly than if I had blogged it right away. When I had just finished it, I felt like it was going to be easy to wear and to match with the rest of my wardrobe, now I know I was right! I also know that one should never try on a high-waisted skirt so close to the end of the year festivities and their obligatory overeating: a skirt that fits perfectly at that moment might not fit so well the rest of the year! My skirt is now a little too big at the waist; I might add a second row of snaps to make it tighter in the near future. It’s a Burda pattern from a few years ago; this was my second time making it. The first time I used a shiny pink fabric, so even though I still really like that first skirt and find it very flattering, it’s not that easy to wear. I wear it a lot in my free time, but it doesn’t feel right for work. So when I found this corduroy remnant at Tissus Passion, one of my favourite fabric shops here in Brussels (it doesn’t look like much, but there are gems to be discovered there! ), I immediately thought of that pattern. 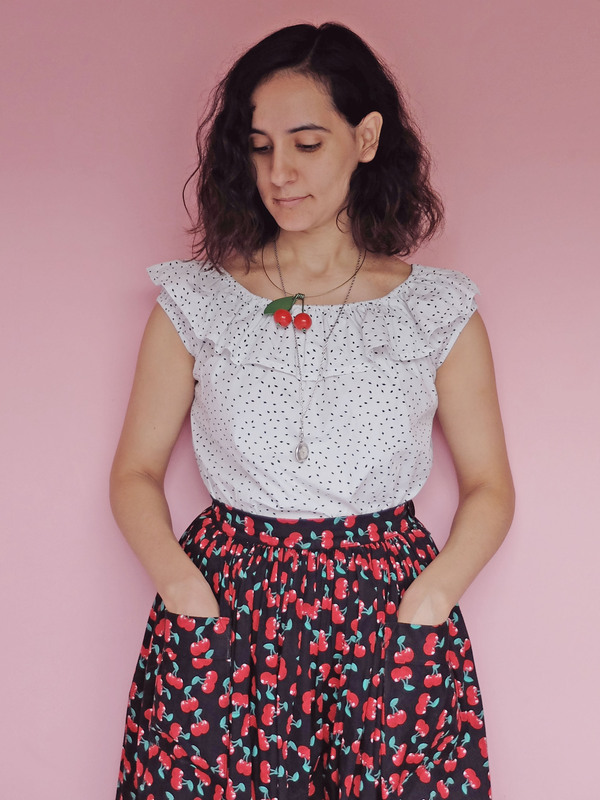 Like the first time I made a size 36, which corresponds to the size of my waist but not of my hips (my hips are between a size 40 and 42), and, despite having to wiggle my way into the skirt to slip it on, once I have it on there’s enough ease at the hips for it to be comfortable. I underlined the skirt pieces with some grey Bemberg rayon lining I had in my stash to prevent them from clinging to tights without having to bother with a lining (come to think of it, I don’t think a lining would have been that much more trouble) and it is very effective: to the exception of the waist that bags a little like I mentioned, I never have to readjust the skirt when wearing it. 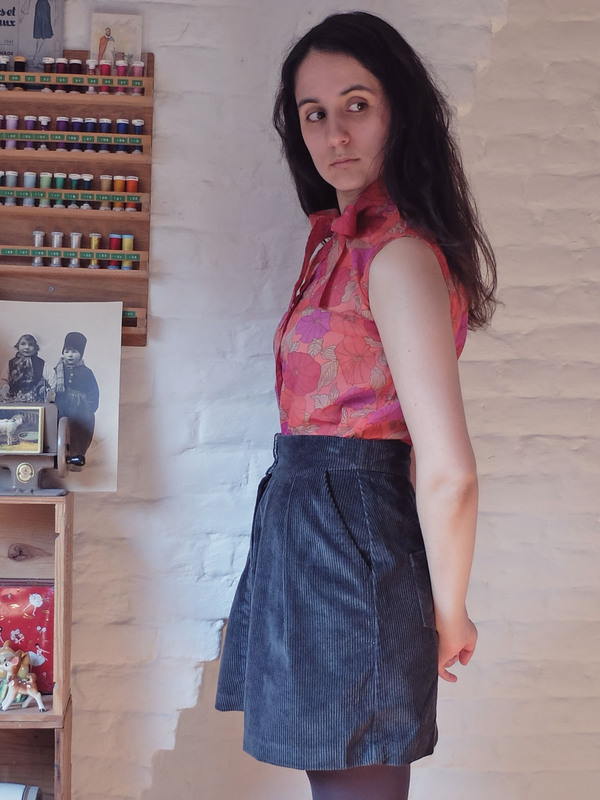 I used a thinner fabric for the hidden parts of the waistband, front fly and pockets: a cotton poplin (I think) with tiny grey flowers printed on it, also from my stash (I got it at a fabric swap). This was both because I didn’t have enough corduroy and I feared the corduroy was too thick to work in those places. Also, it looks pretty. I took advantage of the underlining to hand sew an invisible hem, catching only the underlining with the thread. And I replaced the hidden buttons of the pattern with snaps, and the faux welt pockets with functional patch pockets. 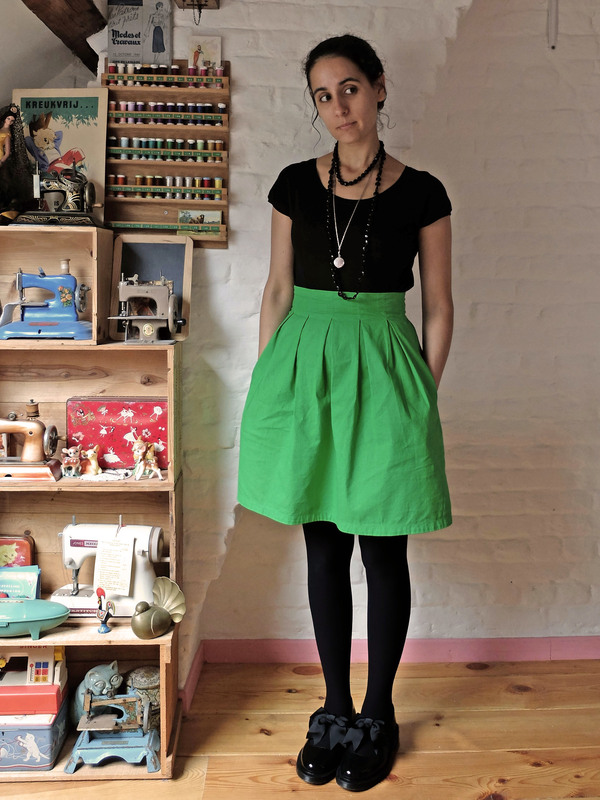 One of the reasons it took me so long to finish this skirt (aside from the fact that I am a very slow sewer) is how scared I was of messing up the fly front zipper. The first time I made that pattern, I didn’t know fly front zippers were supposed to be that difficult and I didn’t have a problem following the instructions of the pattern, but ironically this time I had read in so many places how scary they were that I started to fear that step. 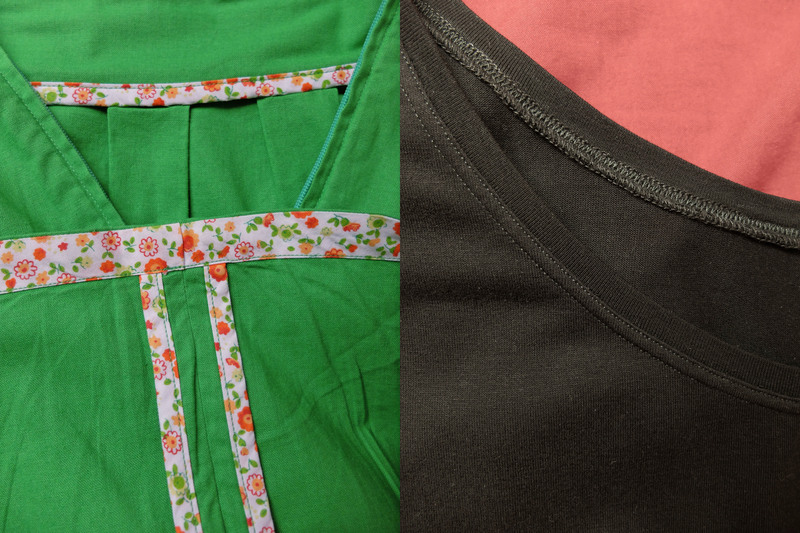 I read a few online tutorials that confused me even more, so I went back to Burda instructions… and everything went, if not perfectly (you can see there’s a small bubble of fabric at the top of the zipper), pretty well! So now I am kind of mad at people who make things seem so insurmountable when they aren’t. No, fly front zippers are not that difficult, you just need to go step by step. And while we’re at it, sewing knits is no more difficult than sewing wovens! I still have a cardigan, a dress and a blouse to show you, let’s hope it takes me less than two months to come back again! 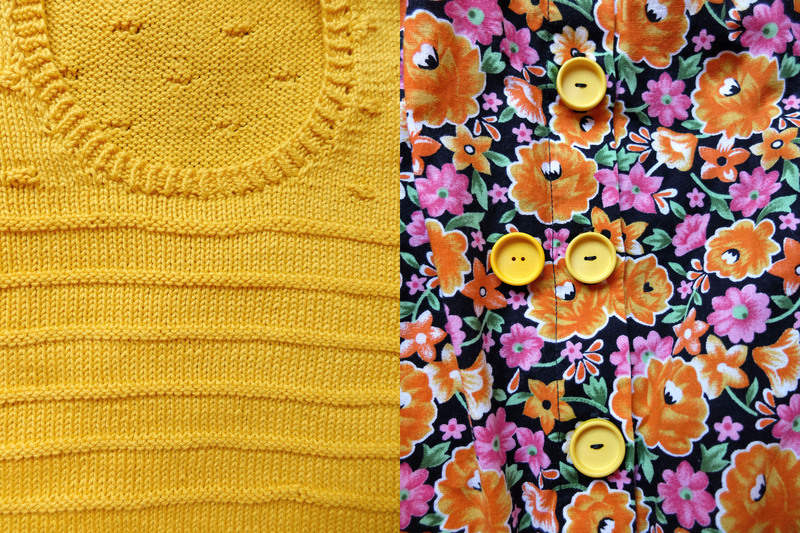 Today I’m a guest on the Georgette blog, where I was asked to contribute a piece around the theme “Go Through Your Wardrobe: Make Do and Mend”. So if you want to see more of the skirt I was wearing last Sunday (MMM ’14 – Day 18) hop on over to the Georgette blog!